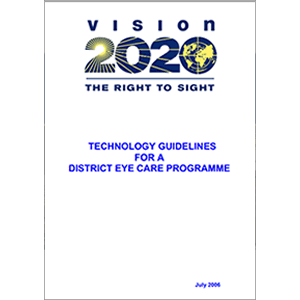 Guidance on the personnel, equipment, and supplies needed for setting up a district eye care programme. Section I deals with the base/district unit and its satellites where there are fully qualified ophthalmic personnel. It aims to provide guidance on the equipment and consumables required for service delivery. Section II addresses the equipment and consumables required by general medical personnel, who have had some training in eye care and are responsible for delivering services. Section III addresses the needs in personnel, activities, equipment and supplies at primary (community) level. Section IV contains a budget estimation. Section V provides information on the ordering and stock management processes involved in maintaining the supplies required.